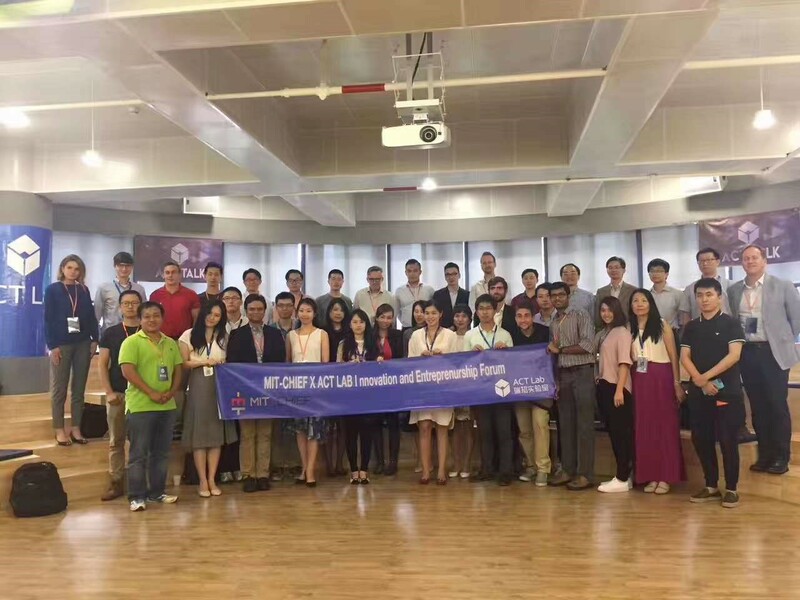 On Saturday July 8, 2017 a delegation from MIT-CHIEF Tech Show in Boston went to Shenzhen, China to visit the ACT Lab. 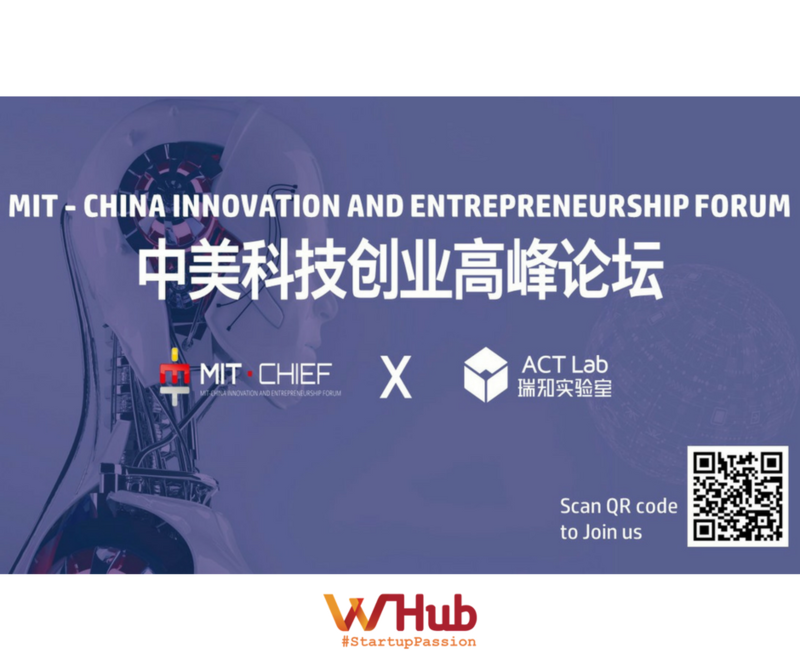 MIT-CHIEF is formed by a group of MIT students in 2011 to promote intellectual exchange and collaboration between China and the United States in technology, innovation and entrepreneurship. MIT-Chief took a select group of students from MIT Lab, chosen for their superior advances in healthcare, food technology, consumer electronics, smart home and robotics, to visit Hong Kong and Shenzhen to learn about and see hardware and supply chain first hand. 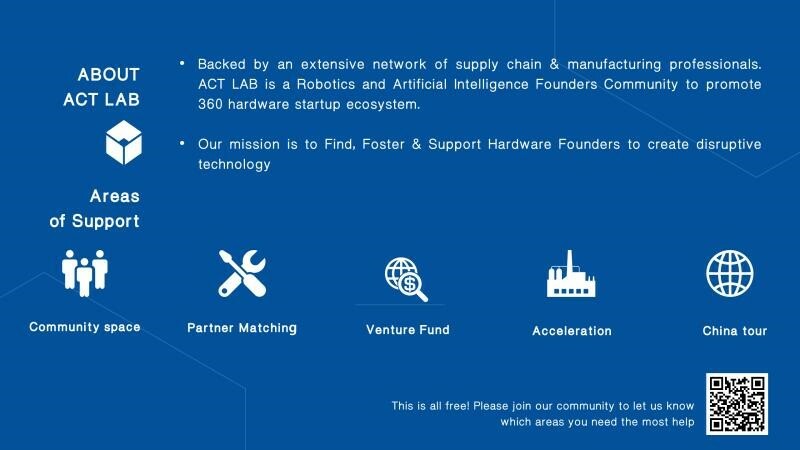 ACT Lab is a hardware ecosystem for Robotics and AI whose goal is to find, foster, and support innovative startups. The day started with a tour of the AAC Technologies factory in the morning to help the MIT-CHIEF delegation understand the MEMS microphone technology and assembly process. With this information, the MIT students and others in the delegation can take their research and design theories forward and apply it in the real world. * Supply chain experts and mentors from the ACT Lab community. 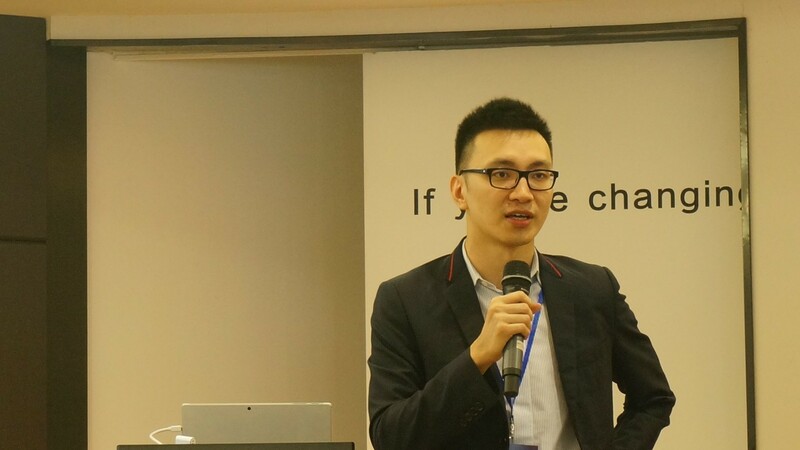 ACT Lab’s Co-Founder and CEO, Kelvin Pan, gave an inspiring opening speech about the growth of the ecosystem in Shenzhen and entire Pearl River Delta. He detailed how and illustrated to us how ACT Lab is packaging these resources into a concise value proposition for growing hardware startups. 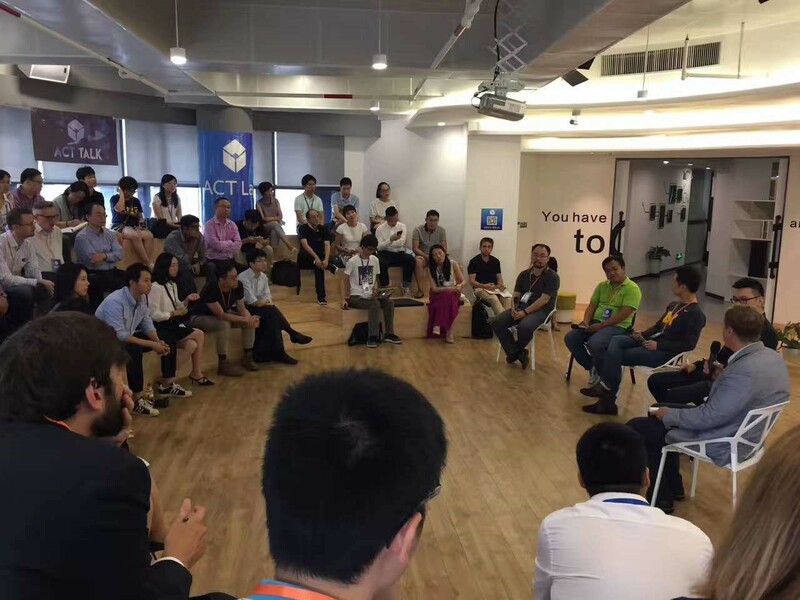 Throughout the panels, the opportunity between further bridging the China supply chain ecosystem with the international market was unmistakable. * Business plan - How will the company be sustainable, in the short to long term? * Technology - What is the plan, from the research and design (R&D) phase all the way up to mass production? Is there capability and execution plans? * Team - A great founding team is imperative with a solid background and track record. This is what will keep the startup going forward through good and bad, pivots, and ongoing investment rounds. Can the team withstand market changes and show a proof of concept? On the innovation panel for healthcare and smart devices, there was a balanced mix of MIT projects and seasoned supply chain experts from the ACT Lab mentor community. With her product Coffee Cookie, Victoria Gregory, an MIT-Chief participant showed the world that together with her co-founder Gabe Alba something fun (a coffee warmer) could be made and brought to market fast. Although they certainly could have added a mobile app or other features to it, Gregory sensibly reiterated this was an exercise on their ability to listen to consumer demand and create a product fast. Daniel Jansson, Director of Product Marketing at AAC Technologies, further discussed the merits of realizing profitable products through a hardware and software integration, something which Vincent Cheung, Senior Director of Product Management at BORQS shared his deep experience of, offering insights into the mobile industry development. 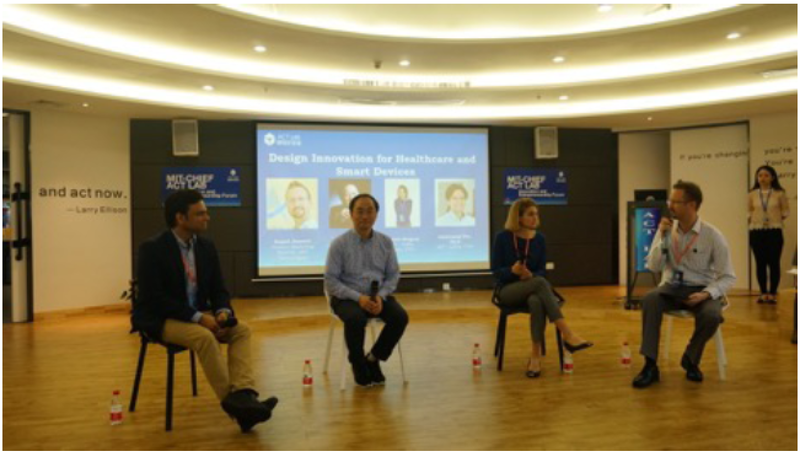 During the talk about Wearables and Healthcare, a deep discussion came with Dr. Lily Li, Fenda’s CTO. As a major supplier of wearables to Huawei and Philips, her company has extensive experience dealing with FDA regulations and other regulators around the globe. She shared her insights on Europe being the best market to start with in launching a new wearable as they are the easier space to deal with, followed by China, and ending with the most difficult market to receive approval - the United States. Others in the panel reiterated her statement by saying it’s necessary to deal with the FDA, and this needs significant capital. Sai Nithin Reddy, a PhD in Mechanical Engineering from MIT and CEO of RightDose, explained that many startups don’t go direct to the end consumer because of these regulations, and instead need to license their technology to large conglomerates. Panelist Antonino Parrinello, PhD and the Global Technology Partnership Manager at AAC Technology (part of the ACT Labs ecosystem) summarized the discussion that these regulations are there to help the end consumer, but they seem to be slowing down innovation and discouraging startup innovation in the space. 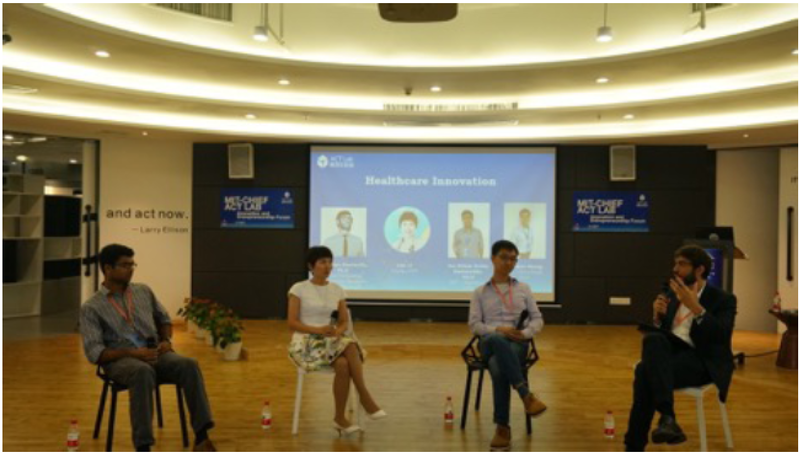 As the talk about innovation and regulation in healthcare and wearables concluded, the panel began discussing how to create value through business model innovation. Dr. Tin Lun Lam is the Founder and CEO of NXROBO, which is a home intelligent robot startup originated in the ACT Labs Program. He was joined alongside 2 MIT CHIEF program attendees: David Morczinek, CEO of Flutter, and Jesse Thornburg, CEO of Kopo. 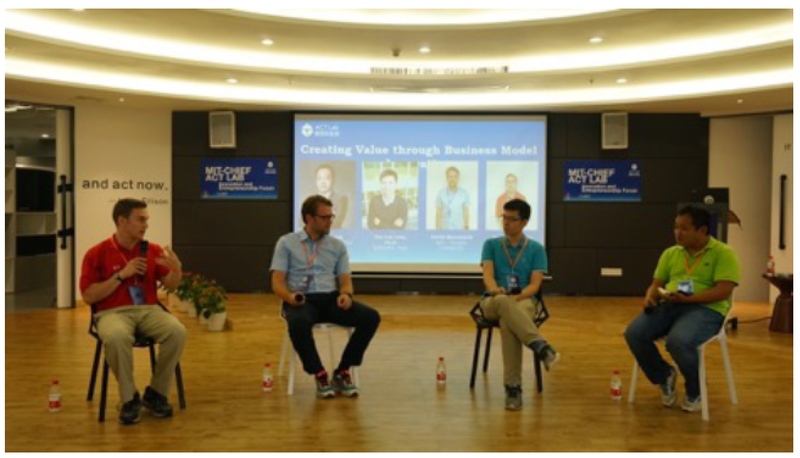 The panel host was Midi Zheng, a supply chain management expert and VP of Yunqi Partners. Digging into their business models over the short and long term, we learned that David Morczinek is pivoting his product involving drone delivery from delivering to end consumers to instead targeting enterprise and simultaneously therefore going through a rebrand. A fascinating discussion with agreement on all sides said that American regulations are too strict for the growing trends in drone delivery and will therefore hold back American innovation. All panelists suggested finding governments with reasons to support innovation in drone delivery. Jesse Thornburg explained how African nations supported this innovation as they need clean water and blood samples to reach the right people as fast as possible. The panel applauded Chinese government regulators for being more open minded and nimble in adapting to this drone delivery space. They encouraged others in the audience to find governments that would be supportive of new innovations in technology. The final part of the business model discussion was the topic of protecting your startup from imitators. Dr.Tun Lun Lam of NXROBO put it simply: go as fast as possible! He said this is the reason he has his company inside ACT Labs in Shenzhen, China. Even though he is from Hong Kong, he needs to be right in the center of the action and be faster and more nimble than his competitors. This shows the value of positioning your business to where your supply chain happens. You can stay ahead of the curve and leverage everything possible to keep your competitive advantage of being first to market. 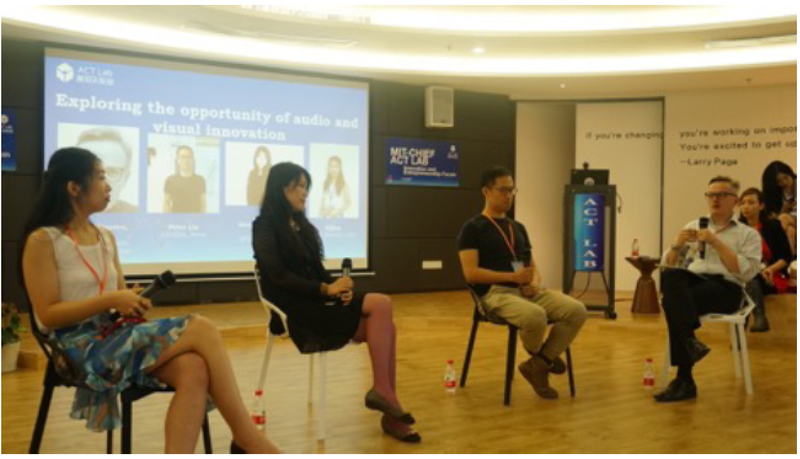 The final panel was about innovation in the audio and visual innovation realm. Yi Xue is the CEO of NOIZE, which created a music therapy kit with bone conduction headphones that help those who suffer from tinnitus. She lightened up the rather deep discussion by using the example of a microphone that was giving static feedback. She explained that the buzzing noise emitted from the microphone is what someone suffering from tinnitus deals with on a daily basis. Peter Lin, CEO of Cinera, the world’s first cinema grade VR headset and also a startup participant of the ACT Labs accelerator, is excited for the future of VR. He says like most breakthrough industries it takes years, even a decade, for it to go into mainstream. All panelists explained that they need to have short term business model strategies and ways to survive until that mainstream market develops. An advantage of being in Shenzhen, China was that you can bridge that gap by having the ability to make small MOQ (minimum order quantity) production runs in the meantime. Pheona Kan gave a closing statement thanking everyone for their time and attention on the East Meets West Forum. 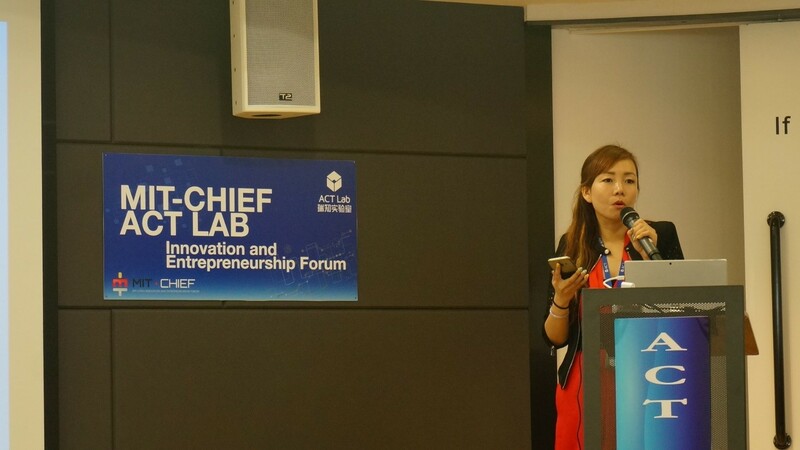 It was evident how hardware ecosystems like ACT Lab can help facilitate the gap between China and the international markets. By leveraging opportunities in supply chain, product design, hardware design, customer matching, and raising money through its own investment fund and joint partners, ACT Lab helps hardware startups in their critical early stage development. 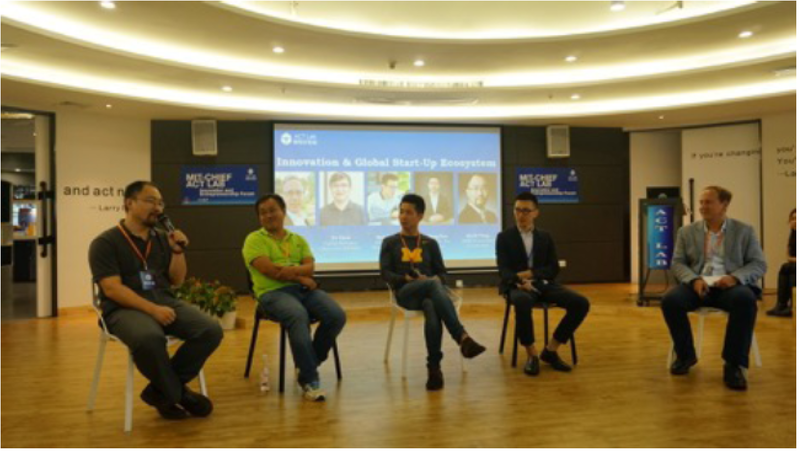 This forum shed light on the challenges and obstacles that exist for technology startups, but more encouragingly highlighted to everyone the opportunity ahead for all those involved in this space.